Powers ten pedals at once. Includes seven 9V and three 18v outputs. Supplies predictable, regulated voltage at all times. More than a power supply, this box is a power conditioner as well. 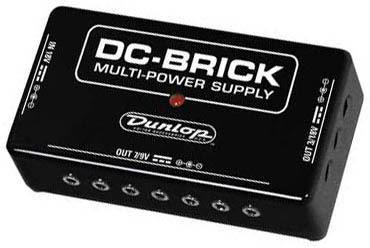 Unlike aging batteries, the Brick supplies predictable voltage at all times, keeping your effects consistent from show to show. Its FCLC (Foldback Current Limiting Circuit) provides ultimate protection against power shorts and overloads. Even at full load, you'll enjoy the quiet and cool operation of a fully regulated power supply. But since battery powered effects rarely exceed 30 milliamps each, you're not likely to use anywhere near the Brick's capacity of 1000 milliamps output! Power: Included ECB006 AC power adapter can use a wide range of international wall power from 100 to 240 volts, at 47 to 63 Hz.